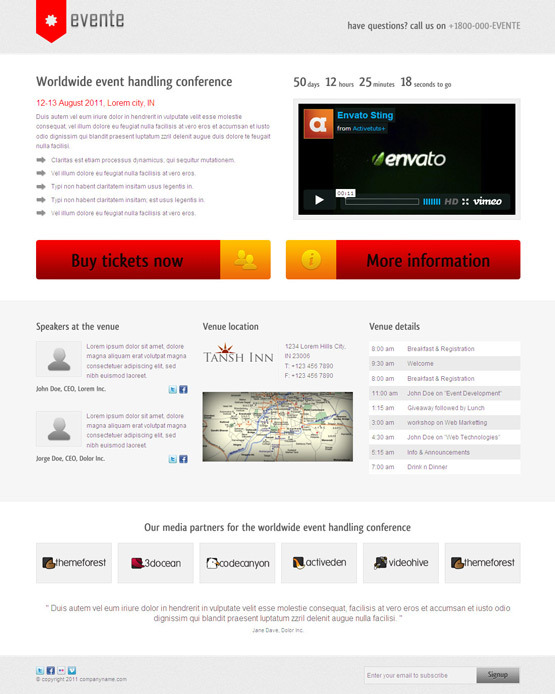 This article showcase wordpress themes and website templates for your event management business. Coded in HTML or integrated in CMS’s like WordPress, those templates works like reliable online tools for any kind of events, from music and show to weddings and human resource business profile. Instead to concentrate at the look of the layouts and graphic design, take your time to see the features of the templates to discover the power of the events management. 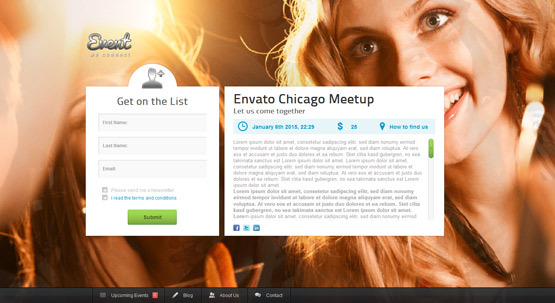 A light and dark wordpress event theme built on latest bootstrap 3.0. These theme comes with 15 amazing predefined colours, full width and boxed layout selection, an integrated slider option for countdown, blog pages, custom contact pages, a non profit donate option and is google map integrated. 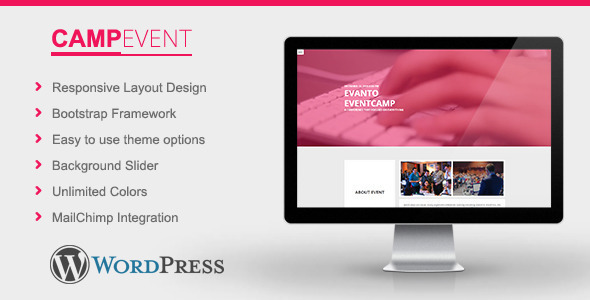 Event on is a wordpress events theme based on bootstrap 3.0. It is fully responsive and displays brilliantly across multiple devices. It is retina ready and images and graphics display brilliantly on large screen resolutions. The theme features an integrated ticket and event add on, over 630 google fonts, 7 predefined colour schemes, event filter, woo commerce ready and an easy to use custom options panel. 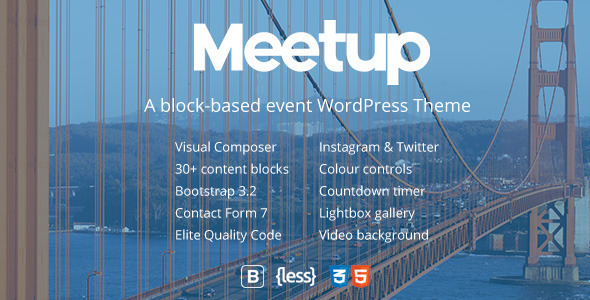 A beautiful block based wordpress theme for events and conference meet ups. 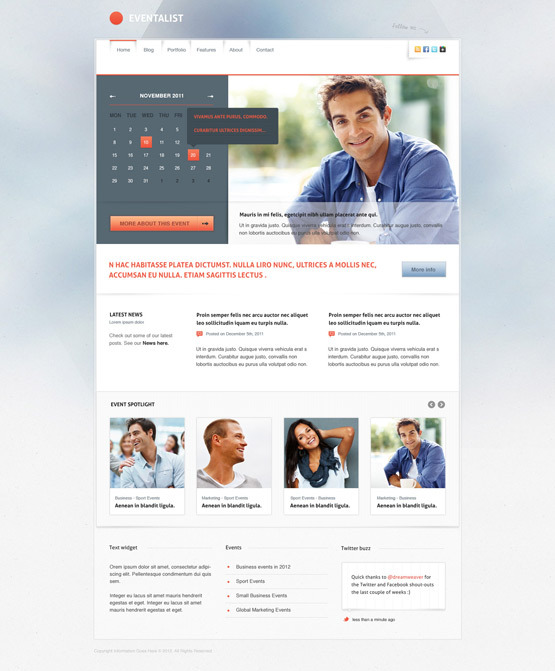 Uses visual composer plugin to design and build pages. 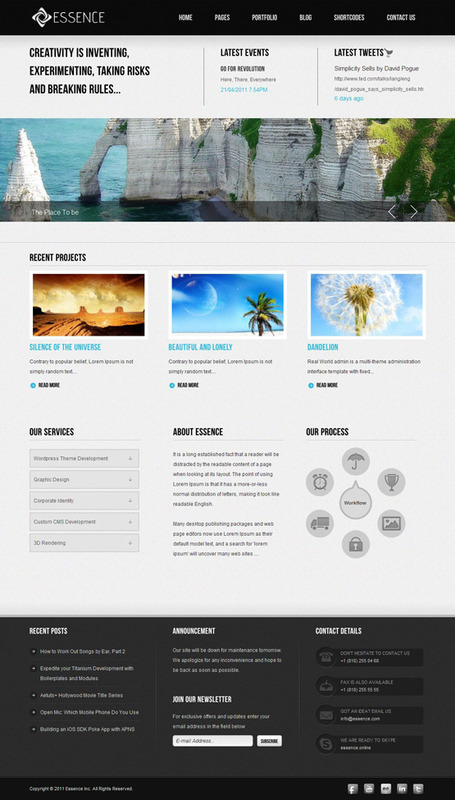 This theme comes with over 30 difference content blocks to use and build your individual pages. Social media integration ready with instagram and twitter. Users have the options of lightbox gallery and a video background. 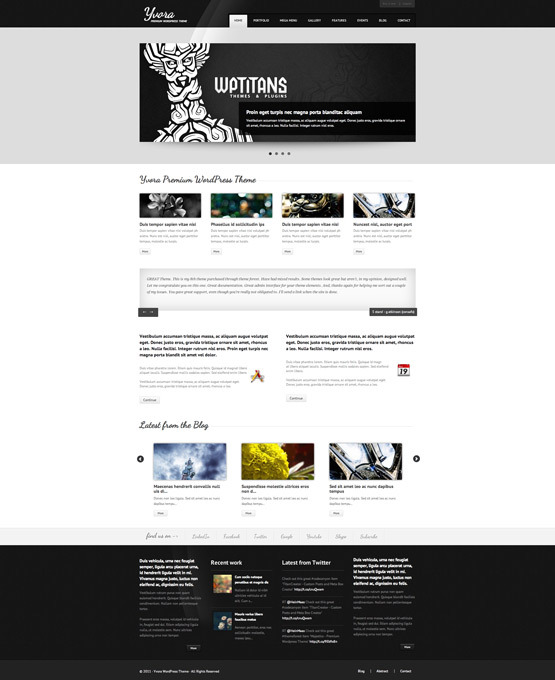 A very robust wordpress theme that is build on bootstrap 3.2 and LESS. 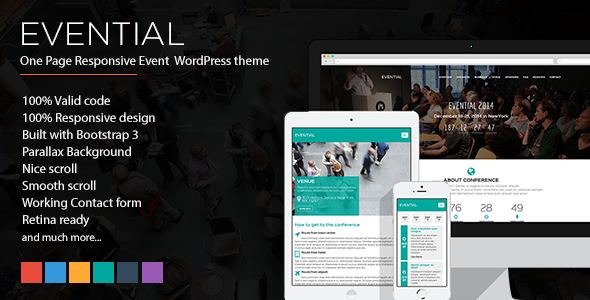 HTML5 and CSS3 wordpress event theme that comes with some out of the box solutions for an events or conference themed website. 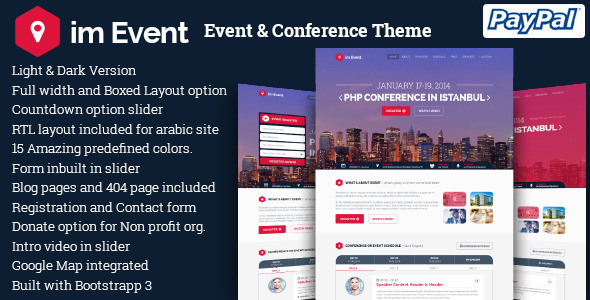 This theme features a page builder, session post type, speaker post type, parallax scroll effects background, paypal ticket payment and manual payments. You can also have an unlimited amount of sidebars and colours to customize your pages. 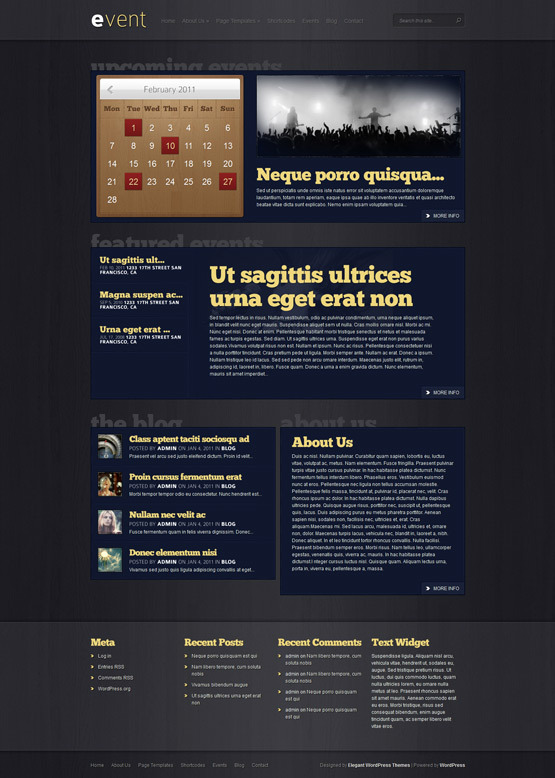 Campevent is minimalistic wordpress even theme that is very light but still powerful on options. It is powered by bootstrap framework and comes with an easy to use options panel. Other features include a background slider, unlimited colours, email marketing mailchimp integration, animated css pages, font awesome icons and is responsive across multiple layouts. 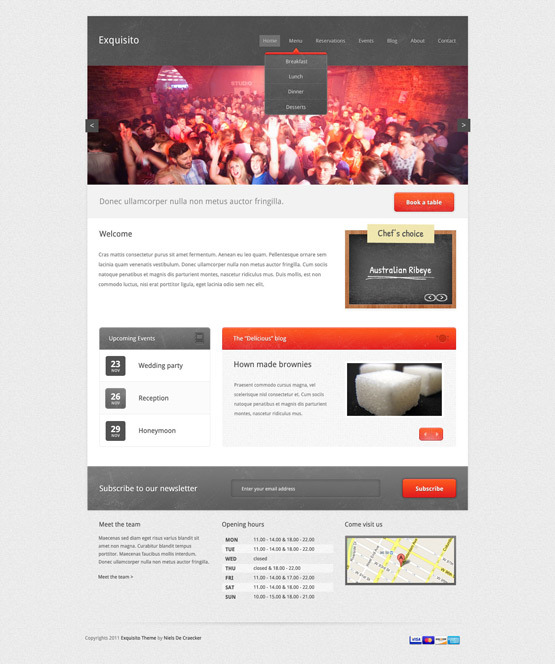 Eventbox is 100% fully responsive events theme with many standard and extra features out of the box. 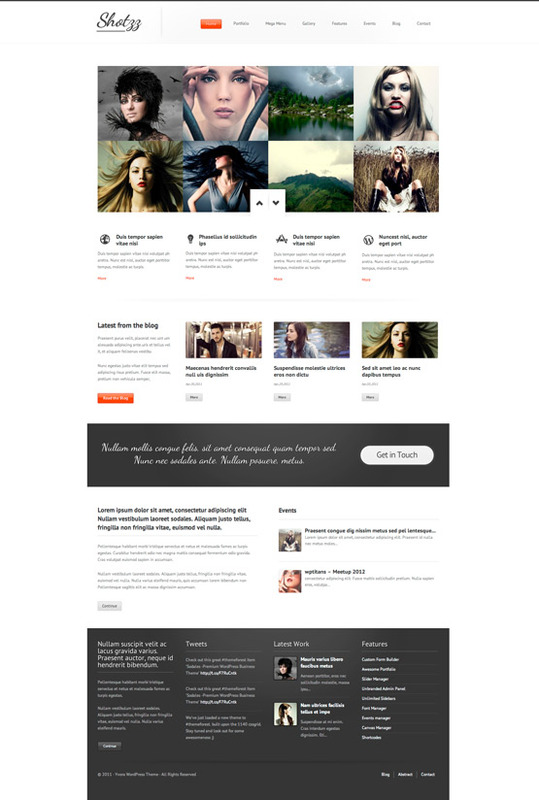 This theme is compartible with WPML and woocommerce. The theme also features clever add ons like the option to add speakers, sponsors and exhibitors. You can create unlimited pages using shortcodes and the bundles visual composer plugin. 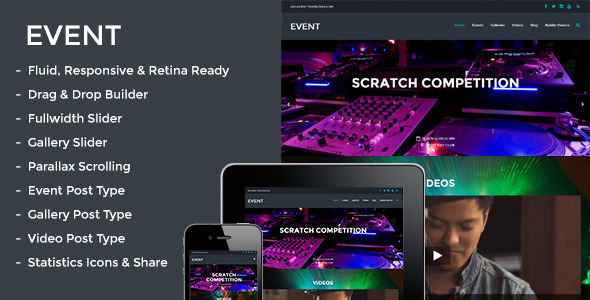 One page responsive event wordpress theme. The theme features a parallax scrolling background, nice and smooth jquery and css scroll, support for retina display, built contact form and 6 predefined colours. The theme also comes with 4 different blog versions with support for unlimited google fonts, shortcodes support, font awesome integrated and a very detailed online documentation. A drag and drop page builder makes this the easiest wordpress event theme available to buy online. The theme comes with ample load of features including a full width page slider, gallery slider, parallax page scrolling, event post type, gallery post type, video post type, retina support and fully responsive. 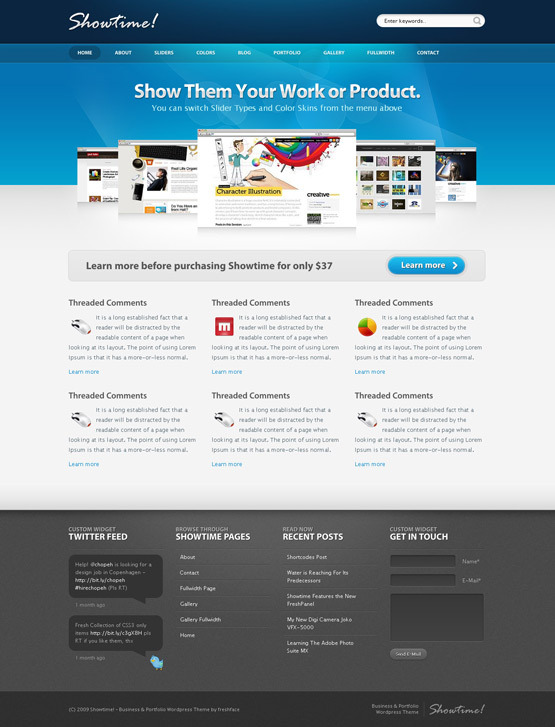 The support for this theme is very well documented and the theme comes with the popular themify plugin. No matter if you throw a party, create an event for friends or colleagues – Event Guestlist Theme for WordPress makes it fun and easy to plan and promote your event and sell tickets for your event! 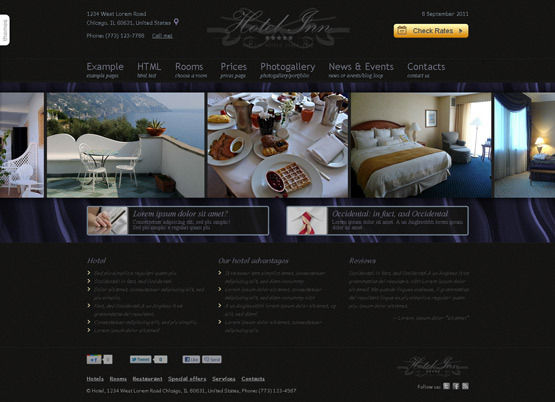 Hotel Inn HTML event management template (theme) is designed to present Hotel or Resort in the most effective way. Attractive design provide the maximum customer satisfaction. Simplicity and flexibility of modularity setting, integration with modern services and easy color changes make our Hotel template an indispensable tool for business owners and web design firms. 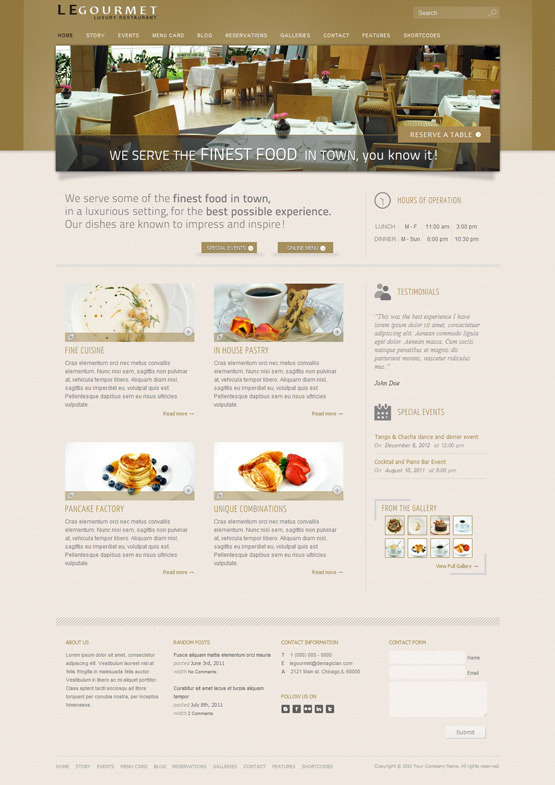 Any hotel/travel or other tourism business can use this HTML theme. Template contain also an event page form. 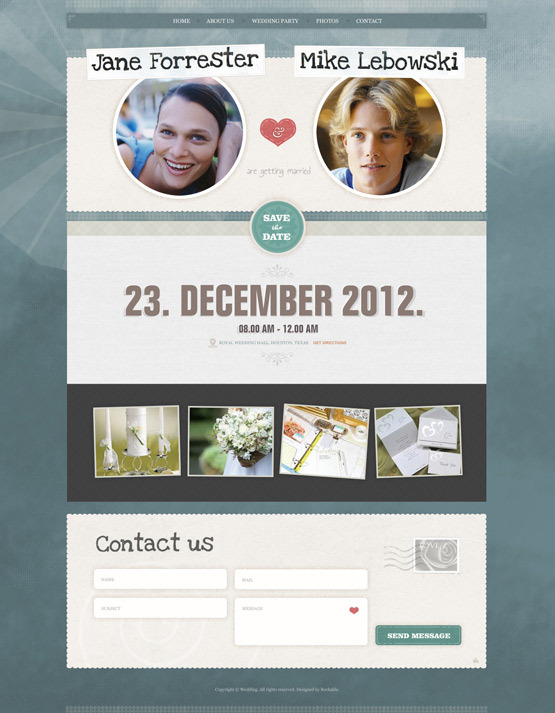 “Our Wedding Page” is a beautiful minimal design template created especially for wedding websites. The template layout design is unique and very easy to use. 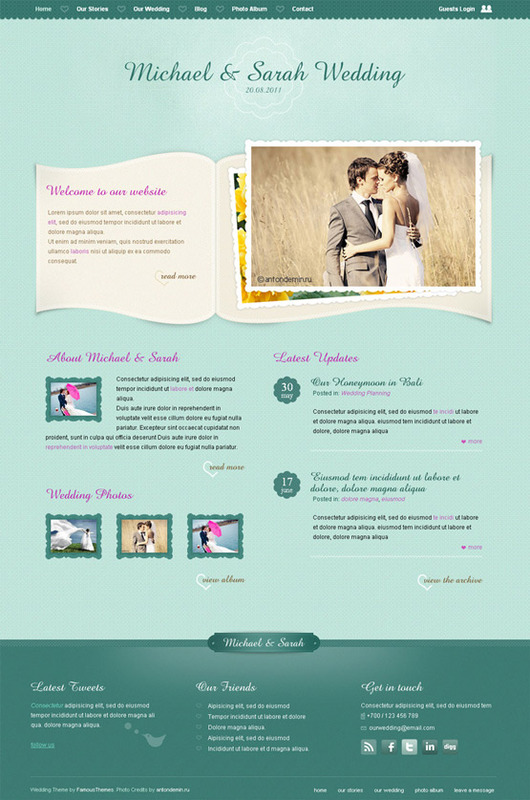 Using this professionally template you will have a memorable wedding event website. 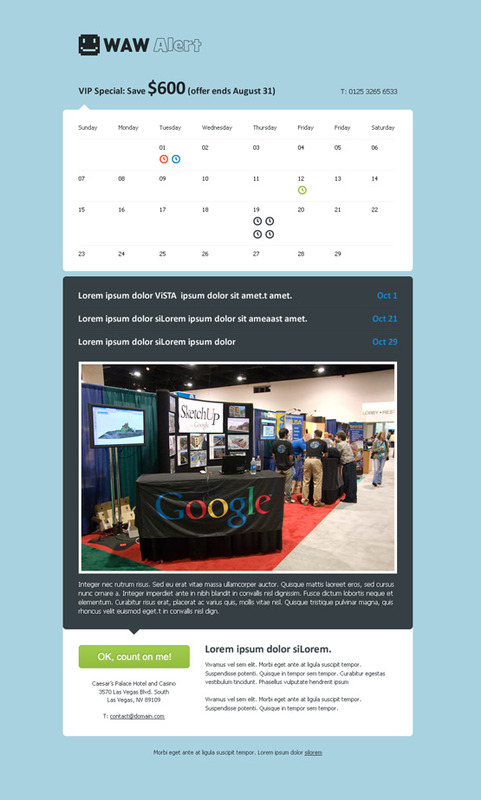 This is a highly customizable email calendar and events email theme. Contain a full and editable calendar scheduled on days / weeks. 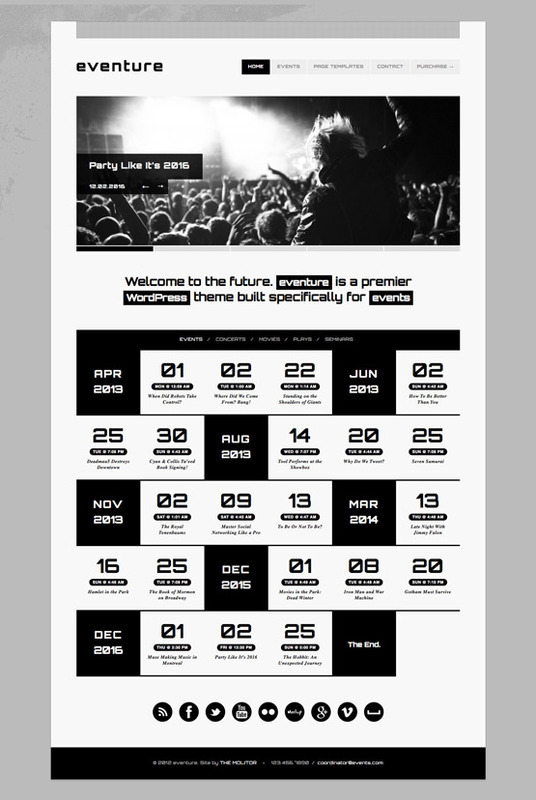 The Newsletter is a hybrid one column design with a friendly calendar inviting and reminder. You will find a beautiful colour scheme and a spaced layout. 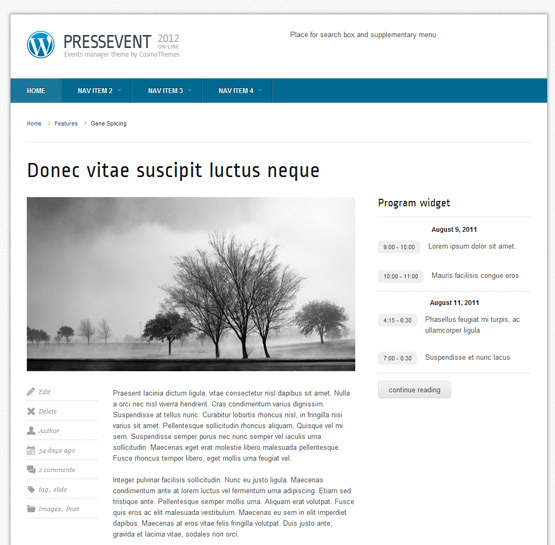 PressEvent is a responsive theme built for your event management. It uses the Foundation framework and can be accessed on all mobile devices, including iPad and Android powered tablets. You can have multiple events or conferences at the same time assigning speakers or guests for each of them. Packed with some amazing and useful features it’s just the perfect theme if you don’t have much knowledge of wordpress. The template has built in a custom event manager, a custom post manager and more. 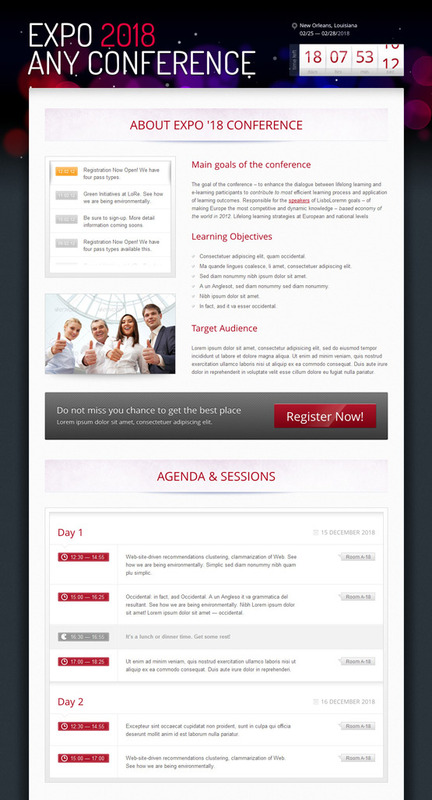 Eventalist theme allows you to transform your blog into an events website. Past and future events are managed with ease from within the WordPress dashboard, and are displayed on the homepage slider. 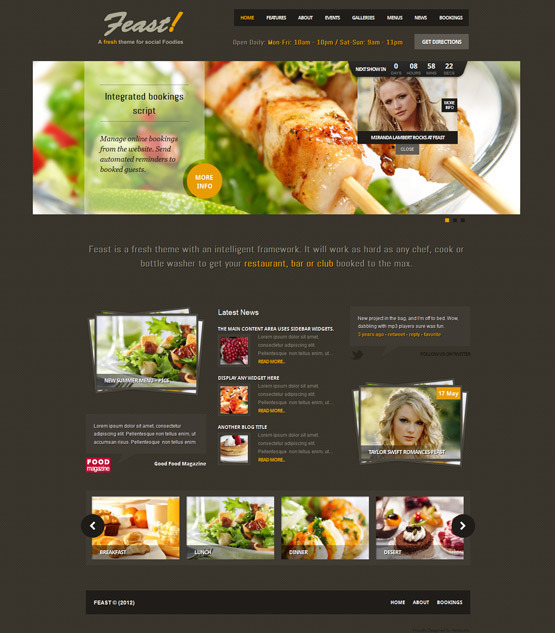 LeGourmet WordPress Restaurant Theme is a super elegant Restaurant WordPress theme, packed with awesome functionality like the events list and reservation subscription form. 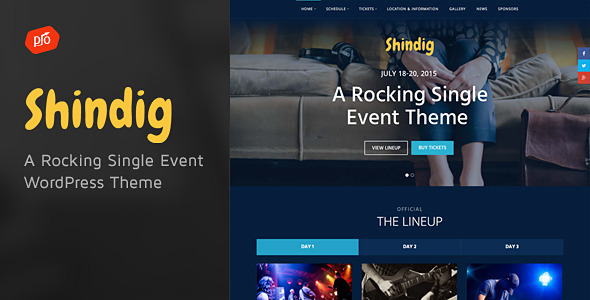 If you are looking for something more simple to promote your events, then this landing page can be your solution. Showtime is a powerful WordPress theme made for your Business, Portfolio or almost any other kind of website. Showtime offers you a good amount of options. 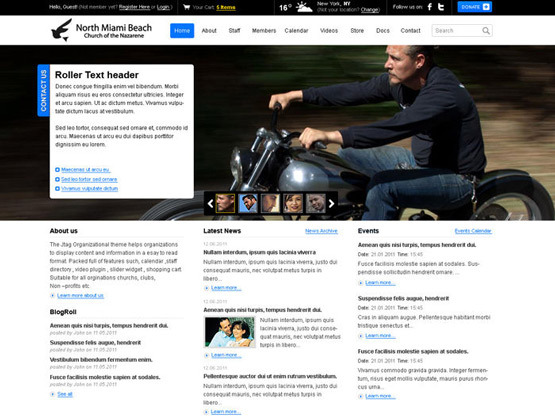 Front Page can be customized via unlimited widget areas, both body and footer. Feast is a intelligent theme with unique features. It’s easy to use, easy to customize and most importantly – it ads functionality not to be found in any other WordPress theme. Contain a great widget for coming events. 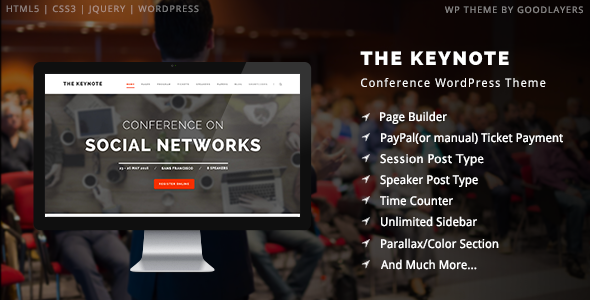 EXPO ’18 is a modern responsive Conference / Event / Training / Exhibition landing page. 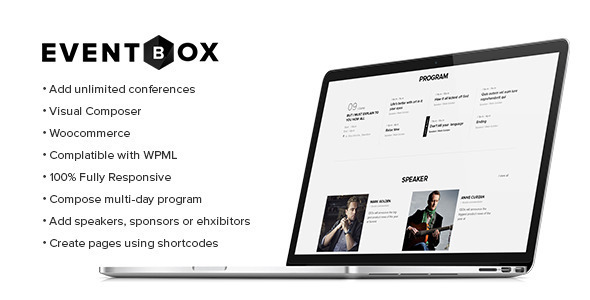 4 main content blocks of the EXPO ’18 (Main info, Agenda, Speakers, Registration) cover all conference-type website’s needs. User-friendly layout, responsive (mobile-friendly) design, registration form and easy MailChimp integration. Also you will get an attractive “ready to action” button, which will provide high conversion rate. Shotzz is a clean premium wordpress theme which is the perfect solution for startups, businesses, photographers, designer and more. Theme contain a built in custom event manager, a custom post manager, canvas manager and more. Check out this awesome, modern and easy to customize one page wedding invitation template. It is designed for young couples who are looking for something different then standard online invitation cards. It’s modern, it’s playful, it’s extraordinary, it’s perfect for both of you! 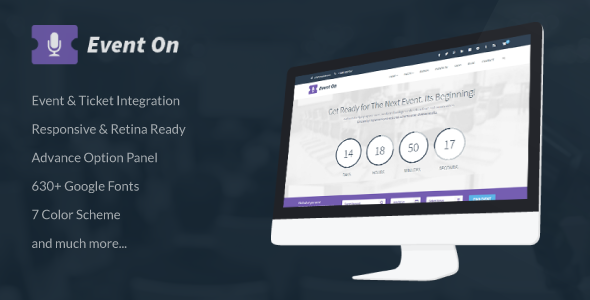 With 9 skins, 2 sliders, powerful custom admin panel, the ability and the flexibility to create powerful and complex event sites from scratch in very short time. JTAG Organization theme is the ultimate theme for Non-profit and small business organizations. Nestled in an elegant design and augmented with unique features such as image cloud member’s directory, document manger, full page slider and our awarding winning JTAG event calendar makes JTAG organization an essential part of your theme portfolio.